“Online communities of practice and personal learning networks are grassroots phenomena. Through them, educators are taking charge of their professional learning, and research suggests the value is real and wide ranging,” says Dr. Darren Cambridge, American Institutes for Research (AIR). Let’s connect the rest of August and beyond! Click Read more to see a copy of the chat that was happening during the webcast. Our guests on this episode of Teachers Teaching Teachers are Cable Green, Mary Lou Foward and Karen Fasimpaur. Cable Green, Director of Global Learning at Creative Commons. Most recently, Green was the Director of eLearning & Open Education for the Washington State Board for Community and Technical Colleges, where he provided leadership on strategic technology planning, openly licensing and sharing digital content, growing and improving online and hybrid learning, and implementing enterprise learning technologies and student support services. One innovative project, the Open Course Library, creates low-cost, digital, openly licensed (CC BY) instructional materials for 81 high impact community college courses. As Director of Global Learning at Creative Commons, Green is responsible for setting strategic direction and priorities to build a global movement that will enable robust and vibrant practices and policies for free sharing of education and learning assets. Cable will lead Creative Commons’ recently-announced project to provide technical assistance to winning grantees of the Department of Labor Trade Adjustment Assistance Community and Career Training Grant program. Mary Lou Forward is the Executive Director of the OpenCourseWare Consortium, providing leadership for the organization’s efforts to support OpenCourseWare use and development globally. Prior to joining the Consortium, she served as Dean of African Studies for SIT Study Abroad. In that role, she provided academic and strategic leadership for 29 programs across the African continent, leading SIT’s incorporation of technology and distance learning in international programming and developing innovative opportunities to collaborate across countries and between diverse student groups. She has also worked on community-based development in Africa, with an emphasis on the incorporation of appropriate technologies and sustainable resources in small-scale enterprise development. Karen Fasimpaur is an enthusiastic user of OER in K-12 classrooms. She works with teachers to help integrate, remix, and share open-licensed curriculum to engage students and differentiate instruction. Prior to this work, Karen was an educational multimedia producer, a textbook developer, and a teacher. 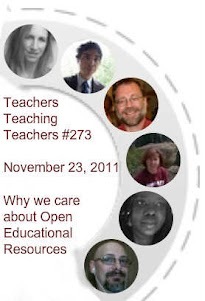 On this episode of Teachers Teaching Teachers we continue our conversations about Open Educational Resources (OER) with this amazing cast of wonderful teachers! I’m finding thatP2PU offers a fascinating space in which to operate. It’s a space with ethos but little structure. I’m building as I go. And wondering, from time to time, if this course meets my general metric for success in all that I do as a teacher – is it useful? Are people getting what they need from the course? Enjoy! Also on this episode: Christina Cantrill, Paul Oh, Kevin Hodgson, Scott Shelhart, Fred Haas, Paul Allison, Harry Brake, and Chris Sloan. 61:35 minutes (14.09 MB) Happy Thanksgiving! 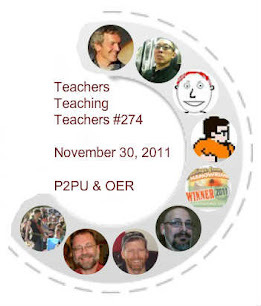 On this episode of Teachers Teaching Teachers we give thanks for OER! Open Education Resources (OER) are teaching, learning, and research resourcesthat reside in the public domain or have been released under an intellectual property license that permits their free use or re-purposing by others. Open educational resources include full courses, course materials, modules, textbooks, streaming videos, tests, software, and any other tools, materials, or techniques used to support access to knowledge. We are joined by Karen Fasimpaur and Antero Garcia fresh from their NCTE presentation (along with Paul Oh and Harry Brake) NCTE 2011 - OPEN EDUCATION, DIGITAL RESOURCES, SHARING, AND NEW LITERACIES. Scott Shelhart and Daye Rogers also join Paul Allison and Monika Hardy .